After struggling to stage a decisive recovery during the first half of the week amid rising stocks numbers in the US, Crude oil prices gained traction on Thursday with the barrel Intermediate West Texas settling 70 cents, or 1%, higher on the day at $69.46. That push came after Saudi Arabia said that it is looking to reduce oil production in August. On another note, Russia's energy minister Alexander Novak also made some late comments over OPEC's oil output policy pointing at production cuts if needed with a new Russia - OPEC organization that may start on November 2019. Technically, the price broke to the upside as expected but got denied by the $70 resistance level. 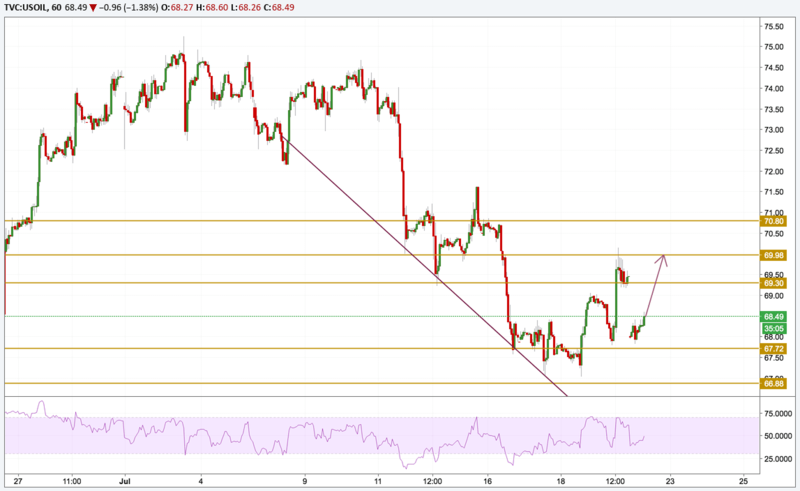 The price is currently holding above the $68 level with a strong momentum that can send it up to the $69.30 level.